home Engineering Library, Gateway Carousel ELTC PSA : Remember Your USB Flash Drives! PSA : Remember Your USB Flash Drives! 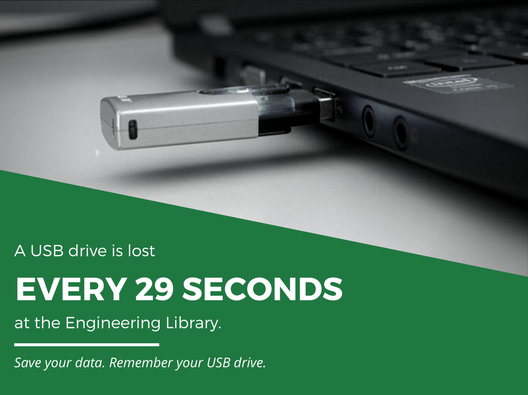 Alright, that 29 seconds might be a bit of an exaggeration, but the Engineering Library does get a lot of USB drives turned in at the circulation desk! Please remember to take your USB drive out of the slot before you leave. We don't want you to lose your assignments! Add a contact folder to your USB drive which contains your name and email so we know it belongs to you. We try our best to reconnect USB drives with their owners and it makes it much easier when we have a contact information. Encrypt the most important files on your drive so nobody can steal your information if you do lose it. Add a keychain to your drive so it is easier to see and remember. Consider keeping backups of your files in a cloud service. Humans are not perfect so the odds of losing a small USB drive can be high. It is good practice to keep backups of your most important work elsewhere in case your USB drive cannot be recovered.